On this week’s Monday Eyeful, I wanted something a little spooky, since I looked so pretty like, and we can’t have that now can we! I do collect many eyes, it is my one true downfall in second life, haha. Some people have hair, some people have shoes, many have gacha items as the crutch now. Mine is, and probably always will be, eyes. 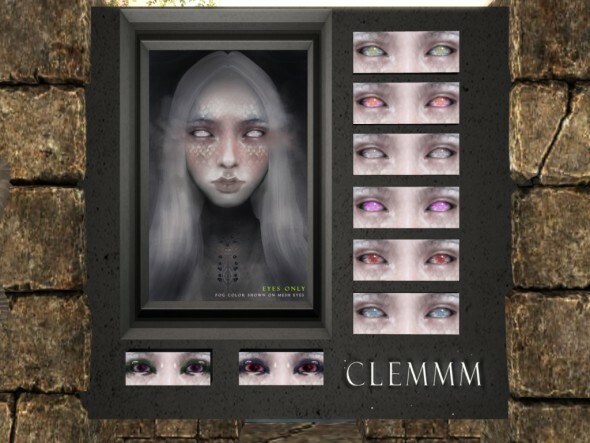 Clemmm makes some fairly unique ones, and if you don’t normally go for something Macabre/Otherwordly/Horrorish, well it is the month to try something out. The prices wont kill you either, they are affordable, which allows you more options to play with. These are called Drowned, and are very eerie. They are priced L$73 per pair. System and Mesh versions are included in each pack. I bedazzled myself a little today, with items from a little known fantasy store called Noble Creations. The majority of their items are Home&Garden related, but they do make some avatar accessories. The feel of the store is Fantasy/Roleplay. The details to each piece are meticulously created, and the textures are so full of depth. All the creations here are 100% original, and worth a look. I’m still getting my windlights remade, as well as making some new ones. I always try to keep them more natural, as I do on location shoots, and don’t edit my photos, other than putting them behind my blogging template. I sometimes will blur a nose triangle, or smooth a wonky pose crunch, but I want people to see the items, and not have to guess what they are. I’d have to say that is something I do, due to being a designer, more than being a blogger. I know more than enough friends who have linked me to ads, from marketplace or flickr, and we have a good time of trying to figure out what exactly they are selling on the ad. I have hard times making windlights that made hard shadows, which still being light enough to see everything, when shooting under prim obstructions, like these trees and mushrooms. I do like how this turned out tho. While the shadows are very very soft, it gives me a sort of moonlit glow. Enough about me tho, lets get to the goods! I almost didn’t go to Collabor88 this round. It’s not an event I always shop at, I have to admit. I am glad I did tho, as I not only found an item I really love, but I found a new to me store. Bauhaus Movement is the store. They made the headscarf with all the flowery bits on it. It takes a bit of creativity to use it. LadyLight has it too, and we both just sort of chucked off bangs and bits, off of mod hairstyles, to make it work to our liking. We both will be continuing our coverage of the Fantasy Gacha Carnival. Here I show you some of the items from May’s Soul, these forest fairy clothing and branch bits. I also have on a collar from A Master’s Eye, which is really lovely. I don’t have a use for a slave collar, but I do love the design of it. IRL I tend to enjoy organic looking jewelry. Things that are offset, and unbalance, or inspired nature itself. This piece delivers that for me. I am posting a day after Fifty Linden Fridays. I really tried to get this out last night, and this is why i normally don’t blog the round, in general, haha. Glam Affair tends to leave their items out late, so please hurry on over, and see if the skins are still out. There are 2 tones in the pack, with lots of eyebrow colour options (which surprised me, haha). They had cute little glasses on for the round too.